Mater, a Beagle-mix, is like any other 14 year old dog. He enjoys spending majority of his time outside with nature, but always knows when to return home for dinner. One Friday he didn’t come home and that’s when Kathy Olson started to worry. She told The Charleston Gazette, “I was giving up hope that he was still alive.” One week went by and they had no luck in locating Mater. 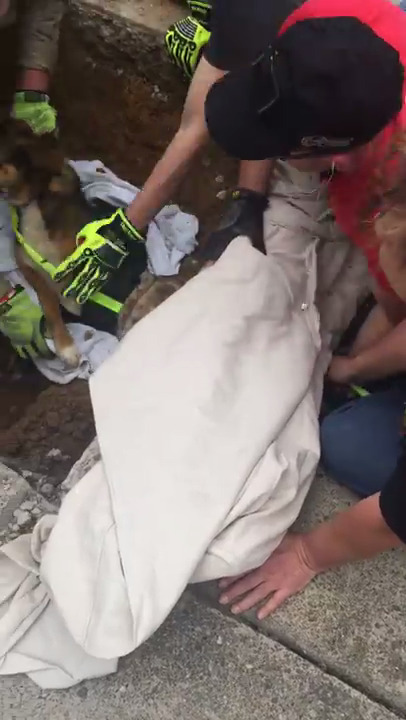 Until some of her neighbors followed a bark to a storm drain. Mater was stuck and calling for help. The Fire Department and utility workers were called in to assist. In order to free Mater, they needed to saw through some concrete and a storm pipe. Eventually he was freed and reunited with the Olson family. According to the Gazette, Kathy took Mater to the Veterinarian to make sure he was okay. Despite finding a heart murmur, he was given a clean bill of health. Watch the amazing rescue in the video below. ← They Were Scammed By A Fake Veterinarian. And Their Pets Suffered For It.